The HYCET Trust® is the trust for today’s times. Since the estate and gift tax laws have now been made permanent, the right trust vehicle can help you make the $5.45M gift tax exemption in a way that your trustee can accommodate you should you have donor’s remorse, or later need or want to recapture all or part of the gifted assets. Conventional irrevocable gift trusts do not afford the donor the ability to reclaim the gifted assets once made. This Is Why You Get to Have Your Cake and Eat It Too! The HYCET Trust is established in a qualifying jurisdiction such as Nevada or the Cook Islands. Future potential creditors of the donor may not reach the assets gifted to the trust. Yet the trust permits the trustee to later name the donor/grantor (or his or her spouse) as a discretionary beneficiary should the donor later need or want all or part of the gift reclaimed. The hybrid HYCET Trust’s revolutionary design makes this the trust for these complex and uncertain times. Besides allowing for the flexibility to later recapture the gifted assets, the trust is multipurpose in that it can be used to freeze the value of your estate by shifting the future appreciation of your assets to the trust, thus avoiding being taxed when you die. 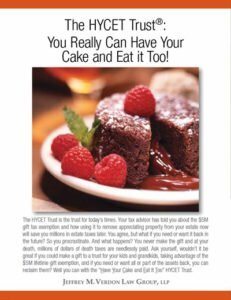 The HYCET Trust is also a comprehensive estate planning trust. It protects assets held by the trust from future potential lawsuits brought against any of the beneficiaries—as well as from the possibility of a divorcing beneficiary’s spouse reaching trust assets, and from a future tax claim or bankruptcy.